When a shopping cart dents your car, hail damage occurs, or you back into a post, your vehicle will need some form of repair. 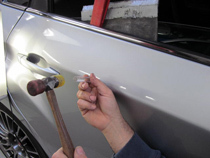 If the dent or ding is not too deep, and if the paint has not been compromised, the most likely form of repair will be paintless dent removal. Paintless Dent Repair is actually a series of techniques for removing minor dents and dings. It is as much, if not more, an art as it is a science. Small tools are used to massage the metal from the underside of the dent to return the metal to its original line. 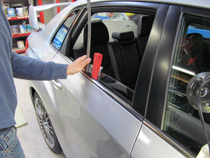 PDR requires highly skilled technicians to make the repair look as if nothing ever happened. In addition to tools, picks, and glue pullers, it is also necessary to use a reflector board. 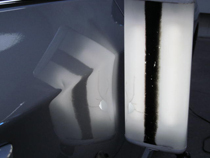 Since the process requires the metal to be pulled or massaged to specific heights, the shadows created by the reflector board assist the technician in seeing how the removal is progressing. Paintless dent repair can be used on both aluminum and steel panels which mean most vehicles qualify for this type of repair for minor blemishes. This repair is becoming more popular, because it’s often less invasive to an automotive finish. There are limitations to what can be accomplished using this method. Deep dents, long deep scratches, creases and areas of broken paint are not good candidates for painless dent repair. Limiting factors for a successful repair using PDR include accessibility, and the degree the metal has been stretched from the damage. Because this is more an art than a science, the process is learned through trial and error. Our technicians are highly skilled with a great deal experience using these tools and techniques. And we stand behind our work.